Guests of Havre will enjoy this prime location. 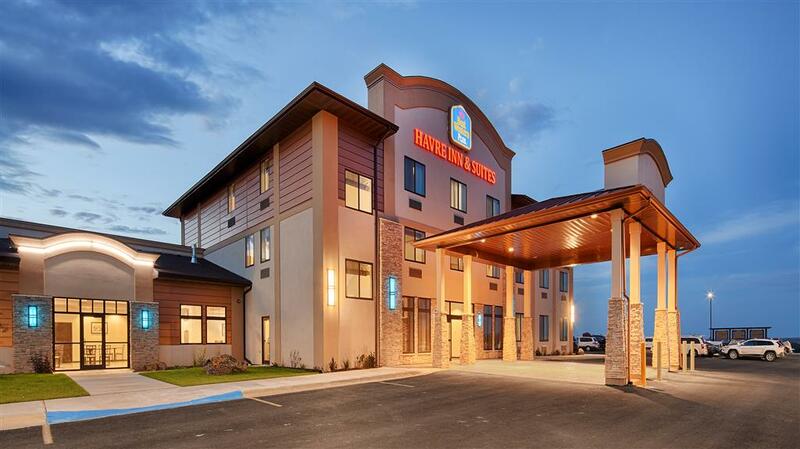 Strategically located west of Havre, the view from the Best Western Plus Havre Inn & Suites offers you a true Northern Montana experience. Guests can view the famous open plains of Montana while overlooking the Badlands, Milk River, City of Havre and a glimpse of the Bear Paw Mountains located to the south. The famous Buffalo Jump is located almost in our backyard. Our hotel will give you a glimpse of Havre's prehistoric history provided by no other. The Havre Inn & Suites is also conveniently located at the Boothill Plaza. With a banquet room and meeting space we can accommodate groups of many sizes, and a maximum of 200. Our experienced sales staff will help you every step of the way to make your special event will be a success. The hotel staff is committed to providing the absolute best in service. Kids will enjoy our waterslide and inviting pool area. There is plenty to do near our Havre hotel, such as exploring Buffalo Jump, the underground museum (Havre Beneath the Streets), the Railroad Museum, the Clack Museum, Dinosaur Trail and Fort Assinniboine. Just a short drive away, guests can visit Beaver Creek Park, the Fresno Reservoir for fishing and boating and Bear Paw Battlefield. The Nez Perce National Historic Park is a popular destination for nature lovers, the Montana Actors Theater always draws a crowd during performance season, and the Depot Museum is just 40 miles away. Whether a day at the Chinook Wildlife Museum or if taking on Bear Paw Ski Bowl sounds better, guests at our Havre hotel can try it all. There are two golf courses where you can work on your swing, while the Lohman Motor Sports Complex provides an adrenaline-fueled day. We are also a favorite for business travelers, including employees of the Rocky Boy Indian Reservation, Montana State University (MSU) Northern, BNSF Railroad and Northern Montana Hospital, and many government agents. Enjoy your stay. From: The West. The Best Western Plus Havre Inn & Suites is located on the north side or on the left of the four lane highway as entering the town descending down the hill. From: The East. The Best Western Plus Havre Inn & Suites is located on the north side or right hand side of the four lane highway departing town and going up the hill. Adjacent to Murphy's Pub, Full Service, American, Open for: lunch, dinner, Murphy's has the best pub food within 100 miles. Largest selection of micro-brewed beer, full spirit bar, large TV's for viewing the game. Enjoy outdoor dining on the patio. 1.5 mile(s) from Havre downtown shopping. Havre's established downtown core provides a quaint setting for many locally owned specialty stores. Located on and around the area of 1st Street - 4th Street and between 1st - 5th Avenues. 1 mile(s) from The Atrium. The Atrium once the home of the famous FA Buttery Department Store is now the collective location for several unique business from a candy store to a bakery and much in between. .75 mile(s) from Ben Franklin, arts & craft supplies, picture framing and fabric store.